What do you like in technique videos? So, I reached the funding goal at Patreon that commits me to starting to work on making technique videos to go with my posts. I’ve watched a fair number of YouTube videos to learn knitting and crochet techniques, and so I have opinions about what I like. I also know that different people learn in different ways, so I thought I’d ask what you prefer. Please speak up if you have strong opinions, though of course there might be conflicting views to choose from. 1. I am not fond of watching someone’s hands hover on screen at the beginning of a video while they talk for a long time about what they’re going to be explaining. My thinking is that I will start all my videos with a brief demonstration of the technique in question (the TL;DW version) and then go into the whys and wherefores and things to try if something’s hard. 2. A solid background, probably dark. 3. The camera looking at my hands from my viewpoint – I have some thoughts about using my tablet or smartphone for this. 4. Bulky yarn in a light color, but not white. I think this makes things easier to follow. Obviously, there’s a lot of things I’m going to need to learn about how to do some of those things and how to edit the results, etc. Please feel free to share your opinions! I originally posted a different version of this on the Advanced Knitting community on Livejournal. I hope I have learned from my mistakes; I certainly appreciate the commenters over there for making me reformulate my thoughts on the subject! Sometime in my teens, I learned this cast-on, which has remained my favorite. I might have learned it from my grandmother; I can’t remember, and my grandmother’s memory is unreliable at best at this point, so I’ll never know for sure. I’m a little sad about this, but so be it. I didn’t know a name for it until recently, when I checked Nancy Bush’s Folk Socks out of the library. It was the first place I had ever seen it described. Armed with a name, I searched on Google, and found only two sets of instructions for it, both text. Here’s the links, just in case they help clarify the instructions I’m providing: Britt Scharringhausen, Lord Gazmuth. 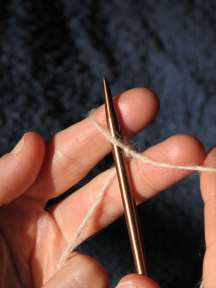 Because it’s knit onto the needle, you can cast on in pattern. I only show casting on with knit stitch here, but you can also knit and purl (handy when you’re about to do ribbing), and I imagine you could do the first row of a lace pattern with it. At the end of casting on, you’ll have completed your first row of knitting. You need to remember that you’ve completed your first row of knitting after casting on. 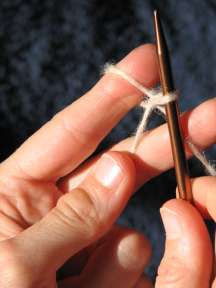 Note: for some stitch patterns, if knit in the round, you may want to purl your cast-on instead of knitting. If you are using the tail as a marker for something, it might be at the opposite end from where you’re used to. As with the more usual long-tail cast on, you’ll need to allow enough tail for the cast on (or else use a separate length of yarn, in which case you’ll need to weave in extra ends). This is a long tail cast on. It’s not the usual method that’s called “long tail” by default. There’s an extra twist in each of the loops created by the tail. 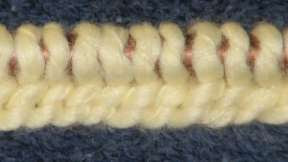 The result is identical to the Twisted German cast-on; it’s a different method for arriving at the same result. First, figure out how you’re going to do the tail. I’ve seen suggestions for the long-tail cast on of leaving a tail that’s four times the width of your first row of knitting. I’ve also seen the suggestion of 1″ per stitch in thicker yarn (worsted) and 1/2″ per stitch for things like lace weight. Alternately, you can leave about a yard of tail, cast on 20 stitches, mark the ends of the tail yarn used in the cast on, unravel it, and figure out how much yarn you used per stitch. 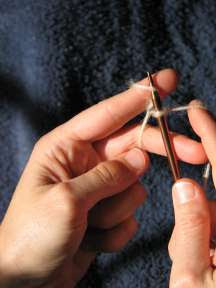 Also leave some extra for weaving in once you’re done knitting. Or you can use a separate length of yarn* from another ball of the same yarn, a contrast color, or the other end of a center-pull ball. 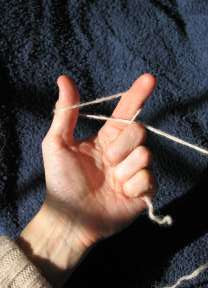 First, lay the yarn over your palm so that the tail end is trailing off the pinky side of your palm (it’s usually much longer than I show here; I’m just trying to make it clear which end is which) and the ball end is lying over the base of your thumb. 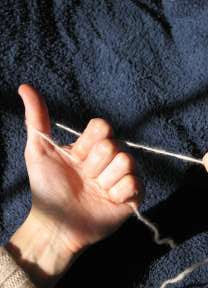 Loop the ball end of the yarn around the tip of your thumb so that the ball yarn is between your index finger and the tail yarn. 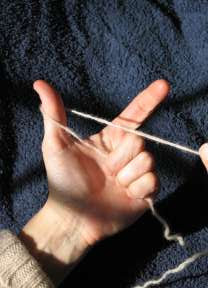 With your index finger, reach over the ball yarn and under the tail yarn. 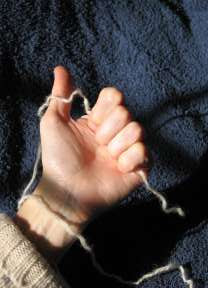 Drop the yarn off your thumb and pull the loop tight around your index fingertip. You now have what is essentially a twisted backward loop on your index finger. I kind of think of my finger as a flexible knitting needle when I do this cast on. I did a little fiddling with two yarns so that you can see the structure of the loop more clearly. Now repeat the procedure. 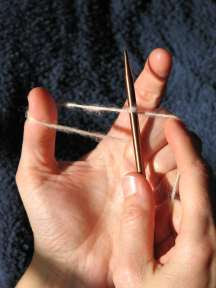 I generally keep the tail yarn held beneath the fingers of my left hand as I cast on. 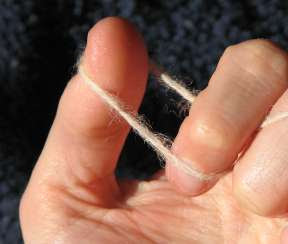 You need to be careful to put the correct yarn under those fingers if you put everything down to do something else. Here’s several stitches on the needle, after I stopped casting on. The tail yarn part of the cast on is a series of backward loops twisted an extra time. They lean to one side (from bottom left to top right). *If you want to use a separate strand of yarn instead of a tail, make a slip knot in the end of it and put it on your needle. Don’t count it as a stitch. Cast on the number of stitches you want. 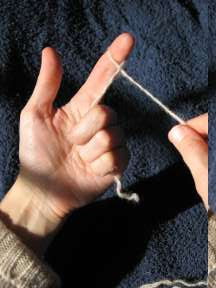 When you can, drop the slip knot instead of knitting it.